As an athlete, taking a break or stopping your training due to reasons like the different seasons is not a very wise thing to do as in some cases, coming back is usually more of a challenge than it was at the beginning. So for real, it is for your good that you get some apparels that will allow you to feel a lot more comfortable while training in harsh weather conditions. An excellent example of such training apparel is the Pearl Izumi Select Barrier Jacket Review. As the name implies the Pearl women’s select thermal barrier jacket is a polyester made jacket which comprises of four fabric technologies, the barrier, transfer, thermal and softshell that gives you comfort at any time of the day, and in any weather condition. Buying any product without making concrete inquiries and taking certain factors into consideration, could turn out to be the most regrettable mistake ever and truthfully it never turns out good. But, with an excellent guide, you’ll make the right choice. And to make the right choice, you’ll have to put into consideration the following factors before making any purchase. These criteria will help you decide which jacket will be useful to you and the reason for this selection is that, firstly, the quality of the fabric of a jacket determines how long it will last and also how useful it could be. Secondly, you will have to acquaint yourself with the features of this jacket. I mean, how many pockets does it have, is it water resistant, does it have layers beneath? You should ask all these questions and equally consider with these features, if the jacket is going to be useful to you or not. And then, talk about the price, and size of the jackets. These, however, are not so challenging as you can easily find them on any online market platform. On such platforms, each product carries a particular number of stars showing how efficient the product is according to other customers. By this rating, you’ll get substantial proof for whichever product you wish to purchase. The Pearl women’s select thermal barrier jacket is a sports training jacket made out of polyester material. It offers excellent protection during cold and windy times, with an interior that gives you warmth. This jacket was designed and constructed to ensure that it would suit a body in motion and not cause any inconvenience. It also has four technologies that allow for the transfer of energy and temperature, the generating of thermal energy, a barrier to block out the cold and a soft shell keeps you protected at any time of the day or during harsh weather conditions. The hem of this jacket is extra dropped for better coverage, and then it also has zipper pockets where you can keep your keys. *Four fabric technologies that allow your system maintain a suitable temperature in different weather conditions. *Can be packed for trips. Very portable. *The waist and the wrist of this jacket is relatively wide. *This jacket is almost not breathable, and so if you wear it for a long time, it’ll become sticky because of sweat. This awesome jacket is made from barrier shell fabric that will help to protect you from the wind and the rain. This jacket was specifically designed to fit perfectly on the user even while in motion. This jacket is a perfect balance of efficient material and anatomic fit. This jacket is made from polyester with the transfer, thermal, barrier and softshell system that creates an opportunity to maintain a particular temperature that will keep you safe from harsh weather conditions. Question: How much wind can this jacket handle? Ans: This jacket can indeed handle strong winds. Question: Is this jacket water resistant? Ans: Truthfully, this jacket can keep you from being wet for a while, but the shield won’t last so long. Question: Is this jacket stretchy? Ans: no this product is not stretchy. 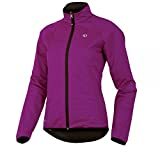 The pearls women’s jacket has acquired quite a reputation with its rating of 4.6 stars out of five stars. Other customers have also recommended this product. Along with the information given here, there are screenshots that you can see, to further help you make understand. You can equally check for more proof on your own from different places and online platforms. This jacket is a superb one, with impressive features, however, if you find that it’s either too expensive or, not just your style, then there are alternatives to pick from as well. This polyester made jacket has the ability, to be used as a cycling jacket and a fanny pack. It equally has a two-way zipper in front and is also water and wind resistant. This dual function jacket comes in a lower price that’s affordable to almost everyone. 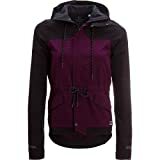 This top rating jacket is expensive too but has got great features like its waterproof and windproof, can be used for mountain hikes, cycling, and other exercises, it’s breathable and has a Windstopper technology, nice pockets in front and sleeves with thumb holes, and a very stylish look to it. If you’re looking to get something with better quality, then this gore jacket is the perfect one for you. It is in my opinion that, jackets are a bit of a necessity when it comes to athletes and trainers. The weather conditions cannot be a problem to such people, so this use of a jacket is inevitable. The Pearl Izumi Select Thermal Barrier Jacket is an apparel with benefits that will suit your needs. You can check more on bicycles if you need according to your jacket. The price of this jacket is quite affordable and can be purchased by a wide range of people. If in any case, you’re not satisfied with this product then there are also alternatives to pick out from, just get one and begin to enjoy your training from now henceforth.